QuickSchools integrates with Schoology, a leading LMS solution which enables unprecedented levels of online collaboration and communication between students, parents and teachers. Schoology’s classroom and online education tools are a perfect complement to QuickSchools’ cloud-enabled SIS. We utilize the Schoology API to connect the two systems together. The Schoology API only supports integration with the Enterprise Edition of Schoology. So the Schoology Integration App will not work with the free/teacher version of Schoology. 1. 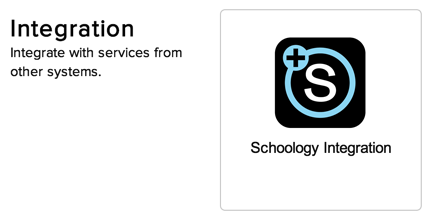 Log in as a QuickSchools Administrator, and install the “Schoology Integration” app from the QuickSchools App Store. You'll be asked to select the teachers that can configure the Schoology integration. 2. Once installed, select the newly-added “Schoology” menu. Then click “Connect to Schoology”. 3. When prompted, log in to Schoology and give permission to the Schoology App. You'll be prompted to log back into QuickSchools. A pop-up screen will confirm the connection and let you know the accounts are linked successfully. QuickSchools will automatically map the students and teachers in your QuickSchools account to the students and teachers in Schoology by name. You’ll have a chance to check the mapping, accept matches, and manually enter anyone not present in both systems. If you’ve only setup your Quickschools account, you can export it to Schoology. Map semesters/quarters, as well as grade levels in your QuickSchools account with your Schoology. You can also export the semesters you’ve created from Quickschools account to your Schoology account. QuickSchools will guide you through course synchronization after students have been mapped. Courses set up in QuickSchools can be exported to Schoology, and courses set up in Schoology can be imported to QuickSchools. Wherever your current course information is, we’ll get it running in both systems. Grading categories from the Grading Setup screen in Quickschools can be mapped with your Schoology account. Once the essential information have been synced between QuickSchools and Schoology, quickly and easily synchronize gradebooks from your Schoology App. Once linked, grades entered in Schoology will reflect in QuickSchools gradebooks, and vice versa. Note that the grading scales cannot be exported, they will need to be set manually in both sites. For more info on this feature, feel free to chat in and let us know your thoughts and questions.